Given that one in every 10 residents of Cobb County is older than 65, seniors in communities like Marietta or East Cobb have plenty of opportunities to make new friends and plenty of activities to enjoy with them. When it comes to senior living, location can mean everything. Fortunately, older adults who live in Athens, Georgia live in a beautiful city full of opportunities for relaxing, exploring, and staying healthy. With Atlanta about an hour away, seniors looking to experience this global city can do it and be home to enjoy a cup of tea before bed. Senior living communities in the Athens area offer more than just care; exceptional assisted living communities offer plenty of activities for residents, trips to engage in the city they love, and much more. Are you up for a day filled with dog tricks, contests, and free prizes? How about a manicure for your dog? 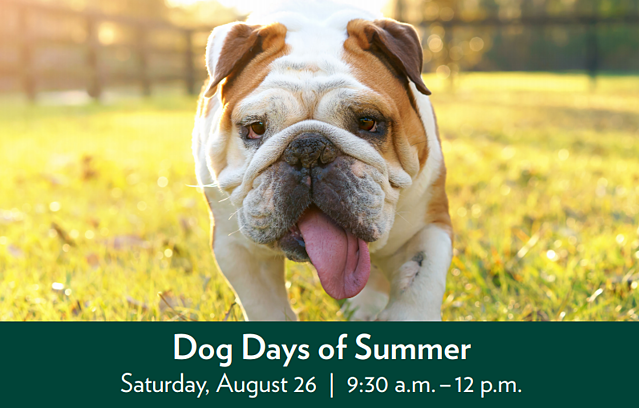 Arbor Terrace of Johns Creek is hosting a Dog Days of Summer event that both you and your beloved pooch will enjoy. This free event will feature a dog trick show, doggy contests, vendor booths with giveaways, refreshments, door prizes, and more. D’tails Dog Wash & Spa will even be offering nail trims to all dogs in need of a manicure at the event. Seniors who adopt a pet during the event will receive half off their adoption fee. The Arbor Company, the South’s premier operator of outstanding senior living communities, is proud to announce the introduction of its unique Bridges memory care program for residents at its Barrington Terrace senior living community in Fort Myers. Have you always wanted to see Arbor Terrace Senior Living? This is the perfect opportunity for you! Tour and "Check In" Any Time from August 1 to August 31. Florence Elsie Nicholson Hunter, or “G.G.” to close friends and family members, has been saying her goal was to celebrate her 100th birthday. Finding the best memory care in Jacksonville can do more than give you peace of mind—it can also help a loved one with Alzheimer’s or another form of dementia remain active and independent for longer. The key, as research indicates, is to look for memory care options that encourage activity, socialization, and engagement in everyday activities at each step of dementia’s progression. Manassas’ blend of historic charm and modern flair makes it one of Virginia’s top communities for seniors to retire to. But before you explore the region’s Civil War history, or its downtown cultural scene, you’ll first need to find a senior living option that meets all of your needs. Living in the northwest suburbs of Chicago certainly has it perks. For aging adults, resources for seniors in Park Ridge, IL, are some of the best in the state. Even better, seniors don’t have to travel all the way to the city of Chicago to take advantage of new learning and health opportunities, though a quick train ride will get you there in no time. Instead, seniors living in the Park Ridge area need only look to their own neighborhood to enjoy some of the best senior resources in the area. Senior living in Naples is easy to find. What isn’t easy to find, however, is senior living in Naples that offers an exceptional lifestyle and experience. At Barrington Terrace of Naples, we pride ourselves on offering seniors a one-of-a-kind home, complete with happy staff and friendly neighbors. Don’t believe us? Check out what just some of our residents have to say. If you are nearing retirement age, or are already enjoying the retirement lifestyle, you may notice that many of your friends have headed to warmer climates. Many retirees choose to eliminate the risk of snow and ice, trekking to popular southern spots like Arizona and Florida. However, there is much to be said for choosing an area to retire that features a four-season environment, nearby cultural opportunities, and plenty of excellent restaurants. Finding senior living Asheville communities can seem like a daunting task. After all, the Asheville area is welcoming to the retired population, and seniors can enjoy a healthy lifestyle here. Our climate is often the perfect compromise for folks who like having four seasons but don’t necessarily want a midwestern harsh winter. Further, our medical facilities and practices are some of the best in the Carolinas. People of all ages can find something they love in our Asheville area, and seniors are certainly no exception. How Do You Find the Best Retirement Communities in Fort Myers, Florida? ts many types of senior living communities, but not every community is the best for your situation. Before you begin your process of looking at Fort Myers retirement communities, know what to look for when it comes to care, environment, staff, activities , and dining. Searching for senior living apartments in Spartanburg, SC can be overwhelming without a plan. The beautiful Spartanburg area is chock full of living options for retirees and seniors, and with its small town feel, this big city is the perfect place to explore senior living options. Beginning your search can feel more manageable and be more successful if you have a better idea of what to look for. Athens has seen steady gains in the number of retirees making their homes there in recent decades, and that’s expected to continue thanks to the city’s southern charm, cultural attractions, and convenient location. Many of them face an important question: How do I find the best senior living in Athens? What is The Cost of Assisted Living in Asheville, NC? The average cost of assisted living in North Carolina was about $600 less per month than the national average in a 2015 survey, which is great news. But individual factors play as big of a role as regional trends in determining actual senior living costs in Asheville and elsewhere. Nearly 10 percent of older residents in Fairfax County, Virginia, live with Alzheimer’s and other forms of dementia, and narrowing down dementia care options can be a challenge for their families. The ideal dementia care solution features staff and facilities built around the unique needs of residents with dementia; flexible and individual care options alongside cognitive support programs; and options that make dementia care affordable. Early signs of dementia are often subtle and frequently go undetected. Your loved one might hide his or her symptoms out of fear or embarrassment, and family members often mistake early symptoms for normal signs of aging. In fact, about half of dementia cases are undiagnosed in the U.S. at any given time. Understanding the different stages of dementia will help you prepare for, recognize, and accommodate changes taking place in your loved one. And amid these changes, it’s important to help your loved one maintain his or her individuality. Because caring for a loved one with memory loss can be a confusing and challenging journey, we want to help families understand and cope. We invite you to join us at Barrington Terrace of Naples for our three-part series on dementia; it is designed to guide and support you along this journey. The winter months can be a difficult time for seniors. Cold temperatures and wintry weather conditions can make it difficult to go outside or to take regular shopping trips and excursions. World War II era biplane landed at the Spartanburg Downtown Memorial Airport to take veterans on a flight that they never thought they’d never get to experience again. Ageless Aviation’s Dreams Foundation brought the plane to Spartanburg on Thursday as part of a partnership with Eden Terrace Senior Living. Join Us for Crab, Live Music and Beer on May 6! You’re invited to join us for Crab Fest on Saturday, May 6 from 11:00 am–1:00 pm! We’ll enjoy lots of crab, beer and live steel drum jazz music! Also, expect a visit from Captain Cookie, a mobile bakery and dairy bar serving freshly baked cookies, local creamery milk and made-to-order ice cream sandwiches. Lastly, we’re excited to listen to live calypso, reggae and Latin jazz by the CAISO Steel Drum Band, as seen on TV! Monmouth County, New Jersey is a wonderful place to call home. Are you getting the most out of the senior resources available near you? We have gathered these resources in one convenient place in the info below. Make sure you are enjoying everything Monmouth County has to offer. In the upscale St. Johns County, Ponte Vedra Beach is an ideal location for tourists and residents of all ages. Nestled along the Atlantic coast of Florida, this relatively small community is known for its resorts, shopping, dining, and golf opportunities. If you have found yourself needing a bit of extra assistance, but don’t want to give up the lifestyle that Ponte Vedra Beach offers, assisted living is the best decision you will make. When searching for assisted living in Ponte Vedra Beach, ensure you are looking for a community that offers you access to the greater area, access to nature, access to new neighbors, and access to the assistance you require. Discovering your loved one has a diagnosis of dementia can be shattering. Not only are you faced with worry and anxiety, but you may also begin to feel the urgency for finding a safe place for your loved one to live. Finding dementia care in the Jacksonville area can feel overwhelming—there are many choices, and determining which is best for your family, and for your aging loved one, requires some research and investigation. Memory Care in Naples: Is It Right For Your Parent? Between 2017 and 2025, the number of people with Alzheimer's disease in Florida is projected to increase by more than 38 percent, the Alzheimer’s Association reports. This will leave thousands of family caregivers pondering whether memory care in Naples is right for their parent. Many factors, such as the ability of family members to provide care, the cost of care, and what’s best for loved ones with dementia, go into the decision. Located on Florida’s beautiful Gulf Coast, the Naples, Marco Island area has been a popular retirement destination for years. In fact, seniors comprise about 48 percent of Naples’ population, which is well above the national average and makes for a vibrant and close-knit senior community. With about 15 percent of the people living in Fort Myers being 65 or older, the small city tucked on the banks of the Caloosahatchee River has become a vibrant and welcoming community for seniors. And beaches, boardwalks, and nature preserves will keep family and friends coming back to visit Fort Myers often. Ann Terrell was recently welcomed as its new senior care counselor Arbor Terrace Ponte Vedra. In her new role, Terrell will act as the first point of contact for families and residents considering Arbor Terrace, a position she hopes will make the transition into assisted living as smooth as possible. The number of people aged 65 to 74 in Asheville, North Carolina, is expected to increase 21 percent over a five-year period ending in 2020, and the number of people older than 75 is expected to increase 15 percent, according to a report commissioned by Asheville city leaders. Nestled in northern Virginia, Manassas boasts historic roots and a lively culture suitable for any age. When searching for senior living in Manassas, older adults and their family members should take into account various factors to choose the best fit possible. To get you started, here are just a few considerations to discuss and research when looking for an active community that will keep you happy, healthy, and engaged. A happy and fulfilling retirement doesn’t require year-round warm temperatures and beach access. Indeed, a suburban retirement can be chock full of cultural, recreational, and social opportunities if you know where to look. Close enough to Chicago for a quick day trip, but full of a life of its own, Park Ridge, Illinois, is a lovely city that would make an ideal retirement location. Living in the Chicago northwest suburbs is ideal for a senior who wants easy access to public transportation, a vibrant neighborhood, and family members who may live in the area. Older adults are known to seek out areas with warmer temperatures once retirement allows them the freedom to do so. For the savvy senior, there is one particular destination ideal for retirement living: Naples, Florida. This large town with a small-town vibe is still considered a hidden gem of the Gulf Coast, and it offers so many opportunities for seniors as well as their family and friends. People often choose to retire to Washington, D.C. suburban communities such as Lanham, Maryland, because of their unparalleled access to the arts, museums, historic landmarks, and outdoor attractions. The first step in enjoying all those activities, however, is finding the right senior living option for you. Seniors often flock to states that offer year-round warm weather and cities that are active and inspiring. It only takes a few days in Fort Myers, Florida, to fall in love with what this lovely city has to offer, no matter your age. If you do happen to be a senior, the opportunities in the area are well-suited to any of your interests, abilities, or preferred lifestyle. The Spartanburg area is a jewel nestled in South Carolina. Not too big and not too small, this bustling town allows citizens to enjoy locally owned businesses and restaurants without forgoing the conveniences of a busy metropolis. With lovely weather and easy accessibility, Spartanburg is the ideal retirement location. If you are searching for senior living apartments in Spartanburg, South Carolina, be sure that you find specific amenities that can give you the best exposure to all the area has to offer.